Let's go history adventuring to an area of downtown Phoenix that should look familiar to you - looking south on Central from Monroe. 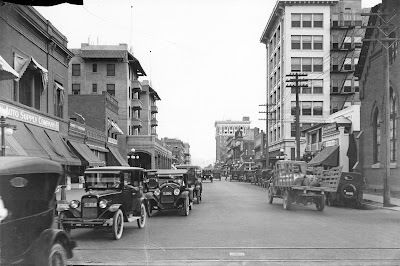 What should look very familiar is the building there in the background, the Luhr's Building, which is on Jefferson, and the building at the right, the Heard Building, still looks pretty much the same, although it's gone through some face-lifting since this photo was taken in 1926. The trolley tracks there are on Monroe. 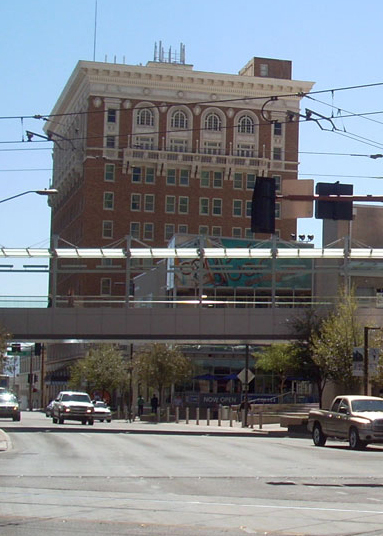 There wasn't a track down Central until the new Light Rail went in. On the left is the Western Auto Supply Company, which was in the old Post Office. Next to it is Pinney and Robinson, Sporting Good Exclusively (the one with the rifle above the sign). And then there's the Builder's Exchange. All of these buildings were replaced in 1931 when the Professional Building was built there (originally the headquarters for Valley Bank, now the Hilton Garden Inn). Then there's the alley (originally referred to as Melinda's Alley) and the Adams Hotel. It's the one that was built in 1911 and was demolished in 1973. 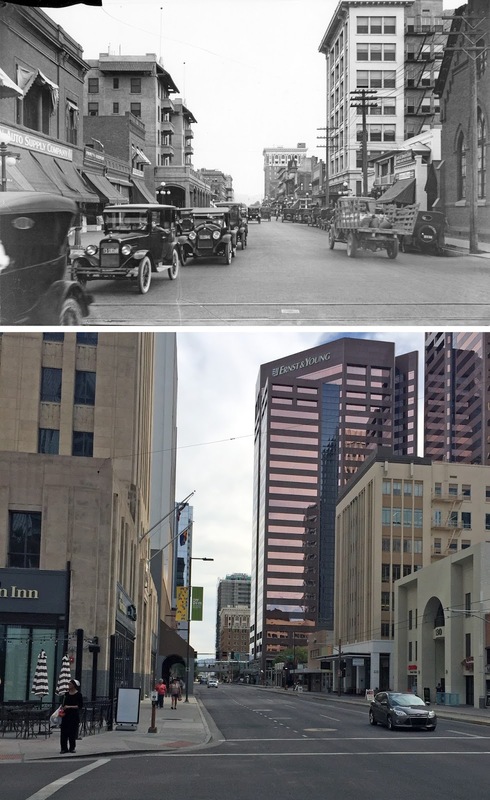 It was actually two of three (the first one burned down in 1910) and the current one (the building that looks kind of like a cheese grater) was originally called the Adams Hotel, and is now called the Renaissance Phoenix Downtown Hotel (it's a Marriott). Staying on the left, and as you look farther in the distance, you can see the First National Bank of Arizona Building, which was on the southeast corner of Central and Washington, then the Commercial (Luhr's) Hotel (you can just see the balconies sticking out), and then across Jefferson is the Jefferson Hotel (nowadays called the Barrister building, and whose claim to fame is that it was the building in the 1960 Alfred Hitchcock movie "Psycho"). The Luhrs Building hasn't changed a bit since it was built in 1925. It's where the Bitter and Twisted is nowadays. The interesting building with the spires was the old Opera House, which at this time was where Hanny's Menswear was (they moved to their new building in 1949). The tall building on the right is the Heard Building, built by Dwight Heard (yes, the guy who started the museum) in 1919. Then there's the Occidental Boarding Rooms (where you see the sign that says "Layner and Bowler Corp., The World's Largest Water Developers". Below that is "Schick and Fagan, City Homes, Ranch Lands". This building was razed in 1929, and the current 130 N. Central (where the Valley Bar is nowadays) was built not long afterwards. At the far right is the original Central Methodist Church, where Michael's Jewelers and the Subway are now. Thank you for history adventuring with me! Watch out for traffic! Aaa-ooo-gahhhh! The Luhr's Building, Central Avenue and Jefferson, Phoenix, Arizona. Looking south on Central from Monroe in 1926, and modern day Phoenix, Arizona.